As with many of my films, the idea for Unbelievable had been around for a few years. As a child, I had loved the American DC comics with superheroes in them, such as Superman and Batman. The comics were very difficult to get hold of and my brother Philip and me often used to buy them in batches while on holiday in Blackpool where we would have a reading frenzy as we caught up on months of back issues. I had thought about making a superhero film for some time, but just at the point when I had come up with a few ideas for the story, the cinema and TV seemed to have had similar thoughts, which caused me to postpone our film. Early in 2007, when ideas seemed to be a bit thin on the ground, I returned to this basic plot to see if I could make it work. Obviously with no real budget, it would have to be a comedy, but it would not be made as a spoof. In a spoof, the source material is ridiculed, but my film was to be more of a homage to the idea that superheroes were around to save the planet and this idealistic notion was not to be made fun of. The comedy was to come from the fact that our hero Bruce, played by Keith Pottage, was a very poor imitation of Superman. Wherehas Clark Kent, Superman`s alter ego is the man of steel, Keith was to be the man of cardboard. His girlfriend was to be played by Emma Wise, who has appeared in several of Phase 4s films and the heroes best friend was to be Paul Crossley another regular face in our movies. I wrote a script which would be long enough for a 10 to 15 minute film, with a basic plot involving "Bruce" having to tell his girlfriend, "Nancy" that he comes from another world. The most difficult part of the story, was deciding how she would react to this news and where the plot would go from there. Act three, is then the resolution of the story. Two shoots were needed. Shoot 1 took place on a full Saturday afternoon around a local reservoir with myself and my wife Carol on the two cameras and Keith and Emma as the two cast members. The reservoir is a favourite spot for walking our dogs and it is always windy around there. The day of the shoot was no exception and althought the microphone was mufflered with a home made wind gag, I had to continually re-position and shield it to record clear sound. We always shoot many takes from a variety of angles and in this case at the editing stage this helps me to cut around gusts of wind when there are some good, wind free sections of sound. This section of the shoot otherwise went well and we moved on quickly. At the end of the afternoon, we returned to our house to shoot the dining scene for the opening shots in the film. This was scripted as a candlelit dinner to open the film and to introduce the characters in our story. It was supposed to be at night, but as luck would have it, it was a rare evening when the sky is clear blue and the evening sun is streaming into our dining room. Despite my usual trick of sticking masses of black bin liners to the outside of our window and closing the curtains over them, the underlit candles and lamps scene was no match for the megawattage coming from the outside. A hasty re-think meant that the scene was re-set for early evening and an exterior establishing shot was added to make this point clear. Shoot 2 involved Paul as the best friend. His first scene was at an outside table at a pub. Although we could have simply gone ahead and shot it, I asked the manager if it was ok to film outside his pub and was given the all clear. Paul had worked late the night before, so needed some pub-grub before shooting could start. The pub was busy and noisy, good for realism, but actuallya bit limiting as I carefully chose the best table to use. There was also a very noisy extractor fan at one end of the building forcing us away into another corner, which unfortunately didn`t include much of the actual location or the genuine customers. We also had a lot of trouble with reflections of the cameras and crew in the windows, which later affected my choice of usable shots. Then it was on to location 2, some fields near our home where the remainder of the film would be shot. Here "Bruce" would demonstrate his powers to Nancy with a few simple tricks. 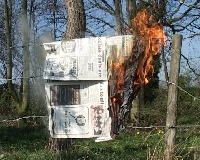 One of these was to be a burning sheet of newspaper. As a safety precaution, Carol had brought a bottle of water to douse a potentially rampant inferno as we set the paper alight with Paul laying directly beneath it. On take 1, with a full blaze going, Carol panicked and threw the water on the flames. She missed Paul but she tripped and yanked the wire of my headphones nearly decapitating me. Unfortunately, the shot was not completed and we had to go for a take 2, which was completed without trouble. Time was running out as we had booked for the theatre that evening, so a few unimportant bits and pieces were left out and the shoot was completed by 6.00pm. 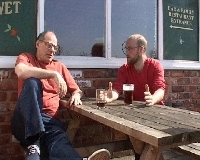 At the editing stage, there were some problem areas, such as the relecting glass in the pub scene and some low-in-the-sky sun in lens reflections which were not obvious at the time of the filming. We also had caught camera 1 in the corner of some shots on camera 2 which involved some post production tweaks which unfortunately compromised the picture quality on a couple of shots. Choosing music was a tough decision as the film was a comic book / childrens fantasy and needed cartoon style music. I agree with some comments that the music is a bit "in-your-face" but the style seemed to fit the way it was written and acted. It is often said that comedy is possibly the hardest type of film to make and I would agree that this is true. You can never be sure if the audience will find it funny and even then, some groups will and others wont. Some parts of the film always get a laugh and other moments pass by unnoticed. In summary, it was a lot of fun to make and for once we all had a good time on the shoots. The film has done reasonably well and although not one of our "high-flyers" it ended up as an entertaining little film with some amusing moments.